Recipe adapted from Nyonya Flavour Cookbook with modifications. 1. 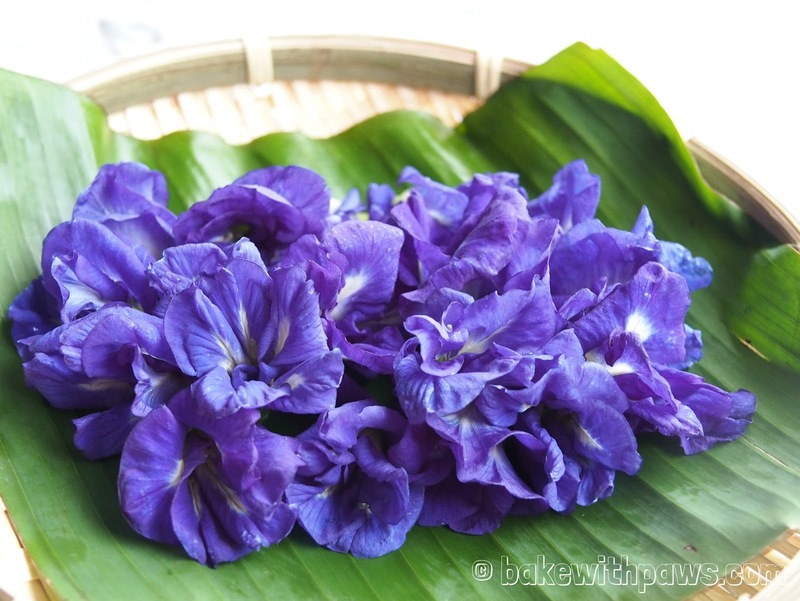 Wash and pound the flowers and mix with water. Strain to extract the indigo blue colouring. Set aside. 2. Wash the glutinous rice. 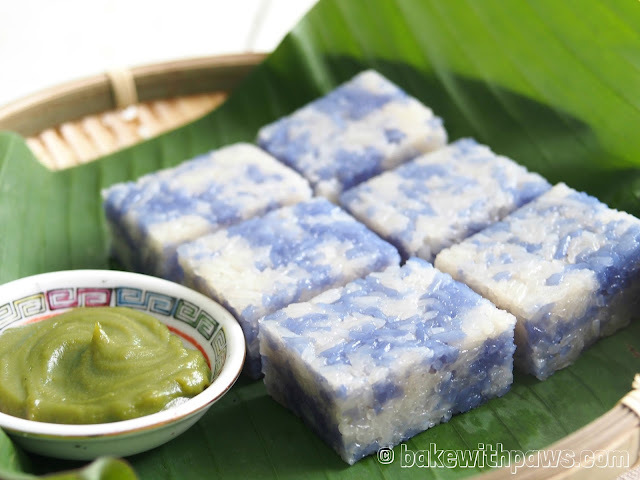 Soak 1/3 of glutinous rice with the blue colouring extract and balance of rice with water. 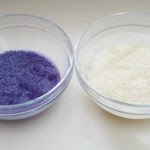 Add ½ tablespoon of vinegar to the blue colouring rice and stir well. Then add 1 tablespoon of vinegar to the balance of rice and stir well. Soak for at least 4 hours or overnight. 3. 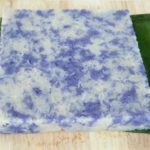 The next day or 4 hours later, the rice should be stained with blue color. 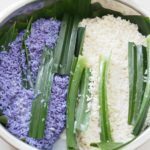 Drain both glutinous rice. 4. Prepare the steamer. Line the steaming tray with banana leave and lightly grease with oil. 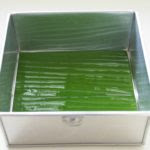 Place pandan leave in the tray. 5. Place both the glutinous rice into the lined steaming tray. Mix coconut milk with salt. 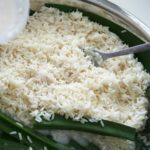 Pour ½ the coconut mixture over the rice and mix well. Steam over high heat for 20 minutes. 6. 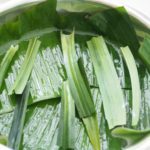 Remove from steamer and fluff the rice with a pair of chopstick and discard the pandan leaves. 7. Then add the balance of coconut milk mixture. Return to steamer and steam for another 10 to 15 minutes. 8. Line the 7 X 7 inch square pan with banana leave and lightly grease with oil. Transfer the cooked rice to the pan, alternating the blue portion with white. Mix well. 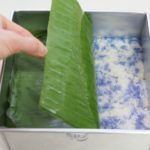 Level the surface and press down the rice with a banana leaf. 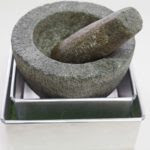 Cover the top of the rice with a banana leaf and place a heavy object on it to compress the rice. 9. Leave to cool before cutting into pieces to serve with Kaya. 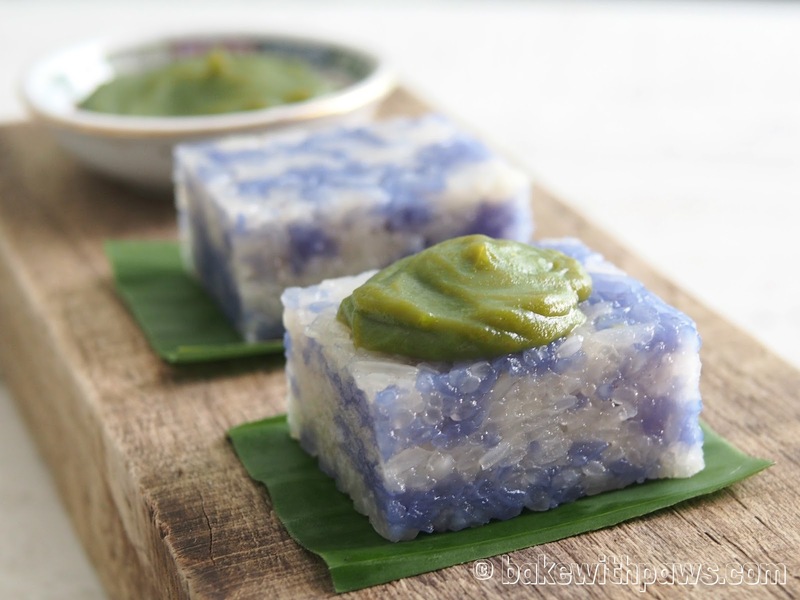 Note: Soaking glutinous rice with addition of vinegar or lemon juice will reduce the phytic acid found in the grain and also helps to break down gluten and better absorption of blue colour. Phytic acid which inhibit the absorption of other important nutrients like calcium, iron, magnesium and etc.